This was the year I would start preserving and canning…at least that’s what I swore when I laid down the money for a canning pot and associated equipment at Walmart a couple of months ago (Walmart being the new Woolworth’s; it is where you will find a lot of the old-fashioned domestic arts type of stuff that Woolworth’s used to carry back in the day). Well, canning with heat didn’t happen, or at least hasn’t happened yet and doesn’t look like happening any time soon. But I have still been making an effort to preserve some of the flavors of summer for the colder months in a less time-consuming and sweaty way. Regular visitors will remember a creole tomato sauce I made and froze for later, for example https://hotcheapeasy.wordpress.com/2011/08/27/fresh-tomato-sauce-criollo-style/. But at this time of year, with all the vegetables we have and the time to work with them running short due to school, I had to shorten even the shortcuts. So I blanched and froze sauce tomatoes for later. 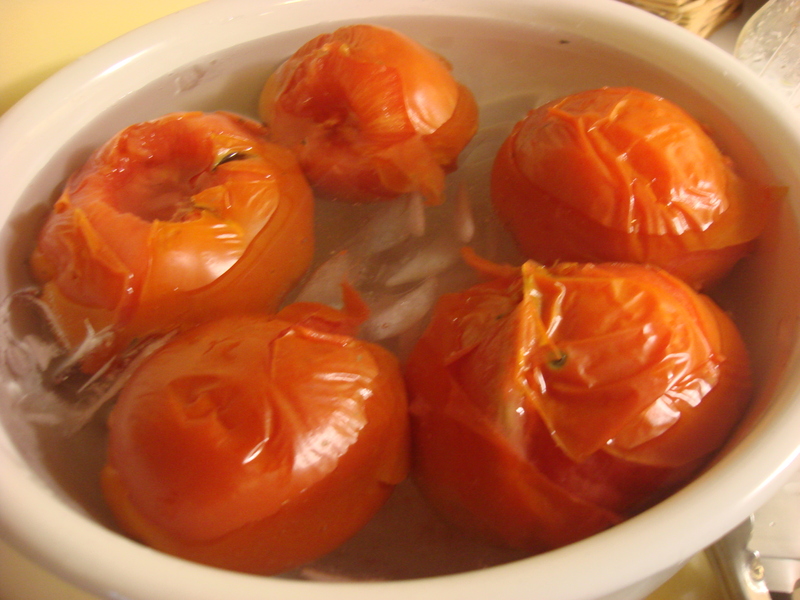 3) plunge them in ice water for about five minutes for large tomatoes and a couple of minutes for small. 4) put them in a freezer bag (quartering them is optional), squeeze out the air, seal and label them. Stick them in the freezer and they will keep 6-8 months and will be suitable for sauces and soups (not salads, as the texture will get mushy over time. 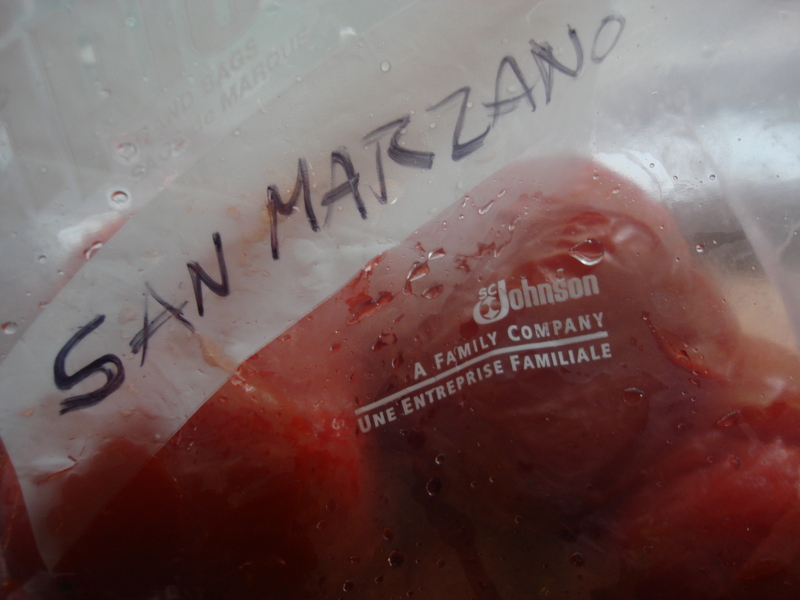 Right now I have a few pounds of San Marzanos, a pound of plum tomatoes and about four pounds of whatever yellow tomatoes it is that I am getting from the farm. I am going to be soooooo, sooooo, sooooo happy to make fresh sauce or minestrone with them in the dark days of February when my arms are about to fall off from shoveling snow! Recommended tomatoes are Roma, Brandywine and plums, as they make great sauce! NOTE TO READERS: Coming this week…a series of ways to use up or preserve the abundant tomatoes from this season. First is lazy preserving…. Hi Karen! Do you saute the garlic first? I too am freezing tomatoes. Right now I am just cooking them down with a little garlic and olive oil, reducing and then freezing. Next week, I will be doing them your way for when I need just a small amount of tomatoes for a recipe.